Gandhi began his official political career in India two years after his return in 1915 with satyagraha or passive resistance campaign he undertook in Champaran and Khera. Gandhi had to replace Tilak as leader of INC, Aurobindo as thinker, and replace armed resistance with passive resistance.What was claimed as a resounding success of Gandhi’s first passive resistance against the British on Indian soil proved to be just a backroom deal between Gandhi and the Viceroy: grant me my demands in Kheda and I will be your recruiting agent for putting together an Indian army for the First World War, said Gandhi. Shocking as this may sound to millions of Indians raised on the diet of Nehruvian version of the history of Gandhi’s Mahatmahood, the truth will become clear when we read what Gandhi himself wrote. In pursuance of my declaration at the Conference yesterday, I wish to respectfully state that I place my services at the disposal of the authorities to be utilized by them in any manner they choose, save that I personally will not kill or injure anybody friend or foe. But it would be better perhaps if I were to state how in my opinion my services may best be used. The last sentence is significant and exposes Gandhi’s first satyagraha in India for what it was. Gandhi wrote to the Viceroy saying that the Viceroy should grant the demands being made in the Kheda satyagraha as a war measure and that he (the Viceroy) therefore need not think the relief which the Viceroy will give now will set a precedent – that the British government will concede to any demand if people undertake satyagraha. So Gandhi knew from as early as 1918 that his passive resistance will not work with the British. Much later, in 1931 Viceroy Irwin would confirm how the British manipulated Gandhi to attain their objectives. While Dadabhai Naoroji was nominated President of the Calcutta Congress in 1906 after a bitter public battle over the issue, the empire loyalists came better prepared for the Surat Congress in December 1907. The INC split in Surat and the empire loyalists promptly disbarred and evicted all Hindu nationalists from the Indian National Congress. Reacting promptly, and as if on cue, and rightly interpreting the split to mean that the Nationalists had no organizational support, the British government arrested Aurobindo and sent him to prison in May 1908. A month later, Tilak was arrested on June 24 and transported to Mandalay. The Hindu nationalist faction of the INC did not survive the brutal crackdown and empire loyalist Gopalkrishna Gokhale regained full control of the INC by the end of 1908. Gandhi left for London in 1888 to pursue his higher education, returned to India in 1891, and instead of establishing himself as lawyer in India, set sail for South Africa in 1893. Gandhi returned again to India in 1901 and once again, inexplicably went back to South Africa in 1902. The grooming of Gandhi for Mahatmahood would soon begin. Gandhi was in South Africa for twenty-one years between 1893 and 1914 – period when racial segregation under Dutch and British colonial rule was putting down deep roots. This segregation would become ‘apartheid’ – the virulent and entrenched official policy of social and political enslavement of the native black people. And yet when Gandhi returned to India in January 1915, the country was told that his non-violent passive resistance in South Africa had yielded spectacular results for rights of Indian migrants – an important historical occurrence that has largely remained unexamined and disproved. Because it is entirely fictitious. Gen. Smuts helped in the development of the fiction by arresting Gandhi on a few occasions to provide the empire loyalists in India an opportunity to speak about Gandhi’s saintliness and the success of non-violence. The South African government, Imperial London, the British government in India and the empire loyalists prepared the ground for Gandhi to take over the INC. They were in a hurry because Tilak’s imprisonment would end in 1914 and he would return home. The INC after the exit of Tilak and Aurobindo was rudderless, without direction and purpose. So, pinning the halo of “the saint” around his head, Gen. Smuts pushed Gandhi out of South Africa. Gandhi left the shores of South Africa on July 18, 1914 but he did not sail to India. He traveled to England where he remained for the next six months. It is not clear why Gandhi chose not to return to India directly from South Africa but spent six months in Britain unless he had to meet important Hindus and Parsis in London and important British government officials to reassure them about his commitment of loyalty to the empire and his unflinching commitment to non-violence. This alone would redirect the INC which under Tilak and Aurobindo had become a militant political vehicle not averse to advocating picking up arms for total political freedom. It would transform the INC into a pacifist, wimpish, de-Hinduised and de-politicised body to gather under its fold the majority Hindu populace with false promises of ‘swaraj’. 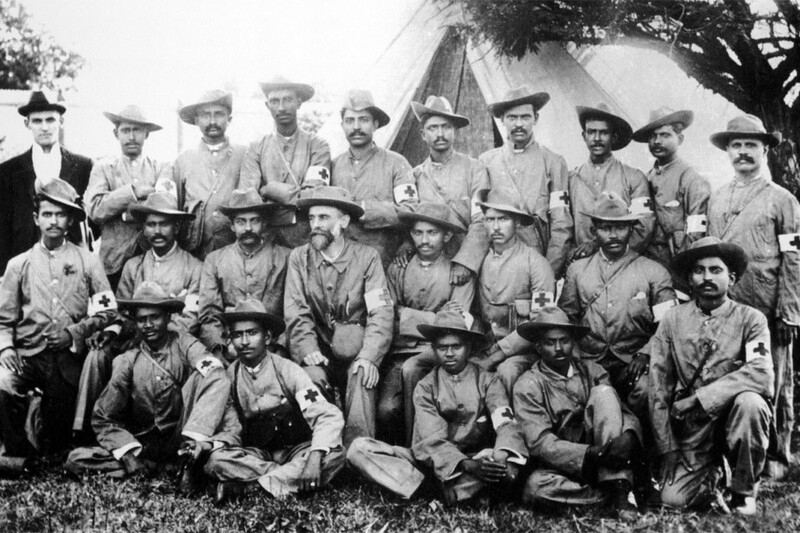 About 11 English-speaking Indians of Durban met together at few hours’ notice on the 17th inst. “to consider the desirability of unreservedly and unconditionally offering” their…services to the Government or the Imperial authorities in connection with the hostilities now pending between the Imperial government and the two Republics in South Africa. The motive underlying this humble offer is to endeavour to prove that, in common with other subjects of the Queen-Empress in South Africa, the Indians too are ready to do duty for their Sovereign on the battlefield. The offer is meant to be an earnest of the Indian loyalty. I venture to trust that our prayer would be granted; a favour for which the petitioners will be ever grateful and which would, in my opinion, be a link to bind closer still the different parts of the mighty empire of which we are so proud. On February 2, 1901 Gandhi laid a wreath on the pedestal of the statue of Queen Victoria in Durban and addressed a memorial meeting, paying tributes to the late Queen. The Hindu nation knows now to its everlasting dismay that Gandhi lived up to the pledge he made in 1906 as leader of the Indian Ambulance Corps to bear true allegiance to King Edward the Seventh and all His Heirs and Successors. But this knowledge came too late and only several decades after 1947. The first thing which Gandhi did after he stopped over in London in 1914 for six months was to pledge his loyalty to the empire again. We, the undersigned, have after mature deliberation, decided for the sake of the Motherland and the Empire to place our services unconditionally, during this crisis, at the disposal of the Authorities. We advisedly use the word ‘unconditionally’ as we believe that, at a moment like this, no service that can be assigned to us can be considered to be beneath our dignity or inconsistent with our self-respect. Gandhi’s eyes may have opened finally in 1942 to the truth, which the Muslim League always knew, and the same truth that Tilak and Aurobindo saw as early as 1905—that the British cannot be trusted. By then, it was already too late for the Hindu nation, and the Muslim League succeeded in its political objective. Radha Rajan is a Chennai-based political analyst. She is also author and animal activist.